The following terms are considered to be accepted by the buyer, and binding that no other written agreement exists, or no objection has been raised immediately. According to these terms all contradictory terms stated by the buyer on the order form, or in any other way are not valid. All shipments are dispatched at buyers risks and costs. Prices are subject to change due to increases of materials and / or labour costs. Prices are subject to change without notice. Complaints can only be accepted within 8 days after receipt of the shipment by the buyer. Payment has to be effected in advance by Visa, MasterCard, Amex, Interac, cash or by PayPal or by irrevocable letters of credit, that has been confirmed by a Canadian bank. We reserve the right of property of the goods delivered, until the full purchase price has been paid, respectively bill of exchange, or cheque has been cashed. Fencing equipment is supplied with safety rating determined by the manufacturer or licenced through a third party (FIE). Crossed Swords Fencing Equipment has no control of how the equipment is certified, used or maintained and accepts no liability for any injury incurred by the user. The user has the responsibility to inspect their equipment before each use and determine if the equipment can be safely used. Crossed Swords Fencing Equipment advises that if here is any doubt by the user as to the safety of the equipment, then that equipment should not be used. While in most cases, Crossed Swords Fencing Equipment is able to fulfill your order from in-stock inventory, this is not always possible. Not all items are retained in inventory and at times, we sell out of any given item. Customers will be notified by email if an item is out of stock, with an estimated delivery time for the order. Crossed Swords Fencing Equipment reserves the right to partially ship an order, however, this is a discretionary decision. 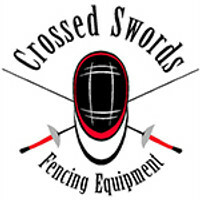 For non-stock items, Crossed Swords Fencing Equipment will order these items as a 'special purchase' from the supplier and will provide the customer with an estimated shipping date from Crossed Swords Fencing Equipment to them, the customer. Crossed Swords Fencing Equipment cannot be held liable for items shipping outside of the estimated shipping date for the order as inbound international shipment times are variable and stock levels of our suppliers are beyond our control. These items are not returnable or refundable.